Whether a story is simple or complex in its innate nature, there are many ways to tell it and to transform it into something of considerably more or less depth. “Me and Earl and the Dying Girl” is about a boy finishing up high school and the circumstances that send him on a particular path, and starting with its lengthy title, this film takes anything but a conventional approach. 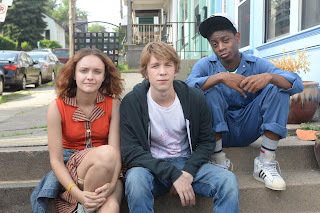 The self-identified protagonist, Greg (Thomas Mann), Earl (RJ Cyler), and the dying girl, Rachel (Olivia Cooke), are players in a wildly entertaining and engaging story that turns out to be far more electric and fascinating than its premise might suggest. Greg begins by introducing himself as the film’s narrator, setting the stage for what could be a perfectly standard story in which he is a floater in the school who can easily latch on to any social group because he has no close ties with any of them. Almost immediately, however, the film’s imaginative style takes hold, as Greg is prone to picturing what happens in his real life in more abstract ways, including the use of Claymation to illustrate such things as the hold that attractive girls have on unsuspecting teenage boys by showing a chipmunk being trampled by a moose. Greg also exercises his creativity by making friends with his coworker and friend Earl, parodying well-known films with absurd variations such as “2:48pm Cowboy” and “A Sockwork Orange.” Greg is forced to take his life a bit more seriously when his mom makes him spend time with Rachel, who has just been diagnosed with leukemia, and a wonderful and unexpected bond of friendship begins to form. Guiding Greg through his final year of college is a commitment to every aspect of his life, not just with Earl and Rachel, both inarguably terrific characters in their own right. The casting of the adults is particularly commendable, choosing excellent actors with mostly television backgrounds to fill important roles that might seem insignificant if put into less capable hands. Connie Britton and Nick Offerman are Greg’s parents, his mother concerned only about his bright future and his father living in his own world, populated most strongly by excessively odd foods. Jon Bernthal is the maniacal, inspirational teacher who allows Greg and Earl to spend most of their time in his office watching classic films. Molly Shannon is Rachel’s mother who shamelessly flirts with Greg every time he comes over, a glass of wine permanently grasped in her hand. The adult actors are matched by the four young protagonists. Katherine C. Hughes’ “hot girl” Madison is far more sophisticated than she might seem, even if her role can be boiled down to a moose stepping on an unsuspecting chipmunk in the wild. The charming Cooke is wonderful as Rachel, mature well beyond her years but still unwaveringly human and real. The hilariously deadpan Cyler, who plays Earl, finds a way to deliver every line as if it’s the signature moment of the movie. And then there’s Mann, who holds it all together with a lead performance that recognizes that he may not be the most prominent player in his own story. 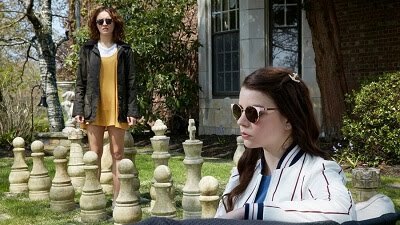 The inventiveness of “Me and Earl and the Dying Girl” is not consistent in its format, which may prove frustrating for some viewers. When the frame tilts as a young Greg and young Earl walk down the street, it seems like that might be a device used again during the film, yet it’s not. Fortunately, there are so many moments of blistering creativity throughout that repeating styles is not necessary. The film is not immune to conventional drama either, as some scenes are presented in a more normative cinematic format with the expected staging and accompanying music. The sum of its parts are more than worth the price of admission, and this film is a deeply involving, engaging, and entertaining ride all the way through its gut punch of a finale, easily ranking as one of the best films of the year.